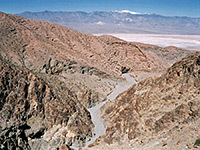 Towards the south end of Death Valley, Willow Creek flows through a moderately deep and narrow canyon for 3 miles, from Willow Spring quite high up in the Black Mountains to the hills at the edge of the valley, where the water sinks below ground or evaporates. The stream is only significant in winter and spring as during the long, hot summer the canyon dries up completely apart from a few algae-filled pools that persist all year. The creek can be accessed from the top end via the 12.5 mile Gold Valley Road, a rather rough track branching off the gravel Greenwater Valley Road, though some sections need a 4WD vehicle. 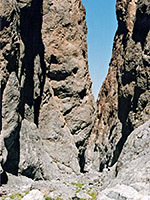 The lower end is much easier to reach by walking 2 miles from the main valley drive, and although the canyon has a number of high dryfalls that can only be passed in the downward direction with the aid of ropes, the west end makes for a nice, easy hike of 3 hours or so, through a short but scenic stretch of narrows. Willow Creek is not signposted and has no official trail. 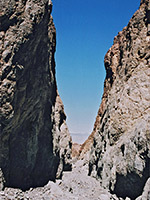 Parking for the hike is at a gravel pit a quarter mile from the highway along a side track, starting 14 miles south of Badwater and a short distance north of Mormon Point. From the pit a faint, developing path heads north following the base of small hills towards the wide wash that emerges from the canyon, at this point a typical Death Valley drainage of jumbled pebbles and boulders deposited by seasonal flash floods. 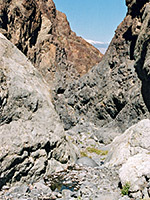 The narrows begin after a 1.5 mile walk upstream and soon the canyon is bordered by near-vertical cliffs of jagged, grey brown igneous rock, which is polished and lighter grey around the streambed. 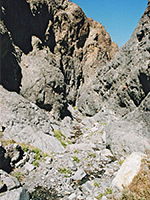 The creek flows intermittently over the stony floor, below ground in some places though rising to form cascades and pools where the surface is bare rock. There are several nice passages and waterfalls but it is not long before the gorge is blocked by a 40 foot high two-stage fall that is not climbable. The cliffs at either side are sheer, preventing any easy bypass of the falls. Starting a little way back is one possible longer route on the north side - up a gully then across the rocks above, though a high climb would be needed to have a chance of progressing upstream, made more difficult by the steep and somewhat unstable slopes. 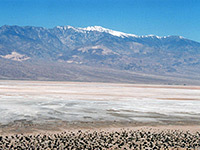 The hillsides, and the canyon itself, have good views down to Death Valley nearly 1,000 feet below, over the pinkish-tinged salt pans towards snow-capped Telescope Peak in the Panamint Range.